Staying somewhere with a story to tell is one of the delights of going on holiday. Our historic holiday cottages are former outbuildings on the The Plas Cilybebyll Estate which has a recorded history back to the early 1400s. Imagine sleeping in a four poster bed in a cottage on a 600 year old estate, complete with wooden beams and parkland views. Some of our bedrooms were once grooms quarters, another the estate office, where it is said the lord of the manor conducted romantic liaisons with local ladies as well as collecting rent from his tenants. Imagine renting a cottage built by descendants of a Welsh King and Knight of the Round Table. 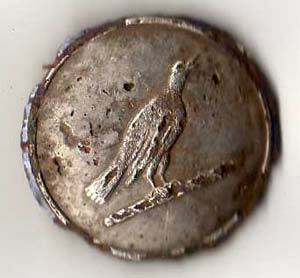 From time to time, old buttons bearing a raven symbol are found in the fields around our cottages. They once belonged to a member or servant of the Lloyd family who owned the Plas Cilybebyll Estate between 1725 and 1957. Their Coat of Arms included three ravens, the legendary symbols of Urien Rheged, an Arthurian knight from whom they claimed descent. 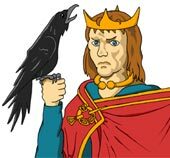 Urien Rheged ruled a large area of northern Britain in the Dark Ages and an army of three hundred ravens were said to have protected his son Owain ap Urien, a story told as The Dream of Rhonabwy in the Tales of the Mabinogion. Perhaps you will be lucky enough to find one during your holiday. Not only will you be renting a cottage, but as a bonus, you may gain protection from the Welsh Princes of the Dark Ages for the rest of eternity! Imagine your holiday cottage came with its own Scheduled Ancient Monument. 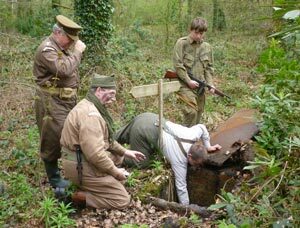 At a secret location in a private bluebell woodland behind our holiday cottages is a World War Two hideout, used by ‘Churchill’s Secret Army’. In 2012, it gained recognition as a Scheduled Ancient Monument of national importance. It is so well hidden that most of our guests fail to find it! The fascinating history of the cottages and farm are told in the book “Small Dreams in a Sleepy Valley”, an off-beat and comic history of Plas Farm and the surrounding area from the dawn of time to the present day. It accompanies a farm walk which starts on the doorstep of our cottages. Taking a holiday in historic accommodation is rewarding for all ages. Finding ways to share your love of history with the younger members of the family can be a challenge. The unique location of our self catering cottages, close to a vaiety of child-friendly attractions (beaches, waterfalls, caves, castles) helps make it easy for you to strike the right balance between the educational and the fun.